Another sneak peek of 2 more new costumes for Poppit Party. The new costumes are scheduled to arrive on January 29th. Screenshots of the new Claire Hart Classic (one shown above), which will be available on January 31st. All of your purchased Claire Hart: Soul Searcher episodes will be playable in this new/HD version. In order for this to happen, Claire Hart: Soul Searcher will be taken down for migration on January 29th. We keep track of all of the upcoming games on the New & Coming Soon page. A Solitaire Gardens Marathon is scheduled to begin February 5th. Update: the February 5th marathon is being advertised as of 1/29 as a Mahjong Escape marathon. It’s not clear whether Llama got the games confused or if there will be a Solitaire Gardens marathon at a later date. Jewel Academy and Jet Set Solitaire both got new levels today. New Cookie Connect levels are planned to arrive in February. Trizzle will be updated to HTML5/HD in late February. In order for your purchased power-ups to transfer, Pogo will take the original Trizzle down a little bit before the release of Trizzle HD. We keep track of all of the upcoming games on the New & Coming Soon page. A new game, Sweet Tooth Town, is expected to be released in February. We keep track of all of the upcoming games on the New & Coming Soon page. The look of this year’s Wednesday badges is part of a theme for the whole year. The line about the Mini Mall changed from “after March 7, 2019 there will be no new content added to the Pogo Mini Mall” to “after March 7, 2019 there will be no new items added to the Pogo Mini Mall”. Q for Pogo: I’ve heard (Insert Pogo rumor here). Are the rumors true? The answer given is the usual, “unless you see it on Pogo.com, it is not true” which is sage advice, however I’d be doing this site a disservice if I didn’t mention that the upcoming items on BadgeHungry’s New & Coming Soon page go through a rigorous vetting process that I’ve honed over the last 11.5 years to ensure BadgeHungry is not starting or spreading any rumors. Q for Pogo: What did you remove the sound of the sniffing dog at the beginning of Word Whomp HD? The answer provided wasn’t actually an answer to the question but it did point out the sound is not a dog but Nestor digging. Too many marathons, it’s quite boring anymore. Not crazy about the weekly badges being “themed” for a whole year. I’ve always enjoyed the unique art styles of badges, but lately they haven’t been all that creative. Excited about Sweet Tooth Town! Any chance of a gem sale soon? Question : Is Sweet tooth Town replacing Sweet tooth 2 ? i am looking forward to all the new games to try this year and going forward with pogo. Poppitt Party and the new costumes will be fun. I honestly don’t know yet! Pogo Llama said in the comments that Sweet Tooth Town sin’t replacing Sweet Tooth. It’s a different game. So I have 513/600 games for one of the missions, and I take this to mean that if I don’t complete all 600 by the conversion I’ll have to start over on getting the 600. Check your Trophy Room so you don’t lose out. This is probably mainly due to the ranks and rank badges not moving over either. These progression badges are similar to ranks and their badges to pogo I guess. It stinks for me as well as I’m close to a couple Trizzle progression badges but don’t really enjoy the game enough to play it outside of weeklies. Thanks for that. But no, I think I’m just going to let it slide. The more I thought about it I realized that I’d have to play a bunch of games where all I was doing was sliding the dolls up and down or back and forth to use up the moves and get the game over with. Where’s the fun in that? Ok Im a little confused? Im not sure if anyone else has noticed. BUT pogo was going to talk more about the new *reward system* to replace tokens in Late December and January but I havent seen any updates on it?? Have i missed something or is pogo trying to avoid it for a while?? My question is, if they can transfer all Claire episodes to the new Claire Classic and they transfer power ups from “old” Trizzle to the new HTML5 version of Trizzle then is possible to transfer data which, for me, means they could transfer our rank progress/ranks and other game stats to the new versions and they simply don’t do it because they don’t want to and they don’t care! So easy for them to just say ” it’s a new game” instead of showing some respect for their customers and all they years we have been working on game ranks. About the new “Yearly “Theme” for weekly badges I will call it “The bunch of lazy persons with zero creativity badge theme”. How boring, over 100 badges all looking alike. I loved to see how they played with the name of the badges, the idea for an image and the final design, some badges were so nice, some others very cool and many many witty and in the end all were highly creative. Such a shame to see all that creativity lost. 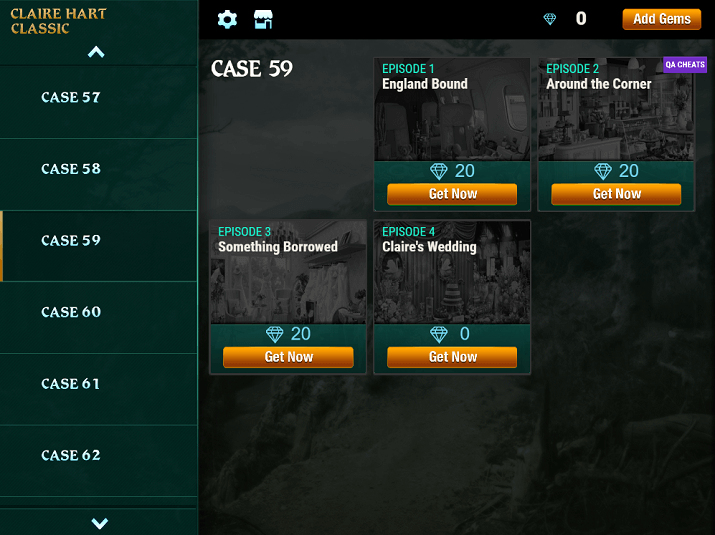 Any chance there will ever be another sale on Sherlock Holmes HOG episodes? It’s been a long, long time since the last one. I thought there were 2 marathons coming up and now I only see the Solitaire Gardens one. Am I missing something or is more of the OA (old age) disease I have? @ nessa FYI Pogo can’t please everyone all the time, maybe they are trying out a new look for Weekly Challenges.